We know you’re terrified right now, especially after Batman v Superman didn’t meet your expectations either at the box office or especially with critics. We know that you want to desperately try and give audiences more of what they want when they say they’re looking for humour and fun in a summer superhero movie. We truly understand that you want to get the DC Extended Universe up and running in time for next year’s Justice League movie. But man, did you guys seriously screw up with Suicide Squad. You just couldn’t keep your grubby little fingers off of writer-director David Ayer’s property and tinker it into a product that’s completely unfathomable and incomprehensible. In fairness, though, it didn’t seem like Ayer was doing many favours, since the film was already an extremely messy affair, but when you guys decided to try and make it “better”, you ended up making it a colossal trainwreck of epic proportions. The film centres around a specially-assembled task force, spearheaded by ruthless government agent and exposition machine Amanda Waller (Viola Davis), which is made up of several incarcerated villains put away over the years by the likes of Batman (a cameoing Ben Affleck). 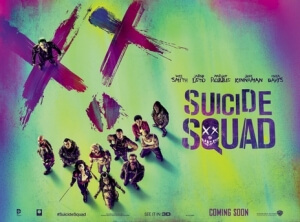 They include the assassin Deadshot (Will Smith), a deformed human/animal known as Killer Croc (Adewale Akinnuoye-Agbaje), a jovial bank robber called Captain Boomerang (Jai Courtney), a tattooed fire-summoning pacifist named Diablo (Jay Hernandez) and, most significantly (at least according to the several cosplayers at the screening we were at), crazed former psychiatrist Harley Quinn (Margot Robbie) who pines for her “puddin’”, the psychopathic criminal mastermind best known as The Joker (Jared Leto). When the powerful Enchantress (Cara Delevingne) decides that she wants to destroy the world for, erm, reasons, the anti-heroes are brought in to take her down with their commander and effective babysitter Rick Flag (Joel Kinnaman), and pretty much the rest of the movie from the half-way point is just them on this mission. Up to that point, however, the film has already proven to be such a hot mess in several ways that it’s almost impossible to care about anything that happens later on. Apparently, Ayer’s original cut was a much darker, more sombre affair not unlike the previous DC films thus far, and when Batman v Superman turned out to be a critical flop for those very reasons Warner Bros did everything they could to have the film match the light-hearted and comedic tone that was promised in the trailers (recent reports have even suggested that the people responsible for putting together those trailers were brought in to “fix” the film). BOY, can you tell that was the case when you watch this film, because the editing is so haphazard and the tone so inconsistent that you swear you were watching two completely different films barely strung together, neither of them being particularly good. Say whatever you want about Batman v Superman or even Man of Steel, but at least they were closer to knowing exactly what kind of films they wanted to be; Suicide Squad is genuinely confused, and it’s hard to enjoy a film where half the time you can’t even fathom what in all seven hells is going on half the time, from random song choices on the soundtrack that don’t tie in to the film at all (Kanye West’s “Black Skinhead” and the opening thirty seconds of Queen’s “Bohemiam Rhapsody” among them) to pop-up title cards that feel very forced and tacky. There is so much studio interference on display here that it is not only distracting, but is also enough to squander any potential this film might have had if they kept their dirty fingerprints off of it. However, even when you take away that harmful element, it doesn’t seem like there was much to Ayer’s vision already. Perhaps it’s due to some serious chopping-down of scenes by good ol’ Daddy War(ner)bucks, but the characters have no weight to their personalities outside of their most basic attributes – Harley Quinn is crazy, and that’s it; Killer Croc is gnarly, and that’s it; and Will Smith is just playing Will Smith, and that’s it – and despite the addition of several backstories to give them more material to work with, for example Smith desperately wants to see his young daughter again, hardly any of them make them more interesting as actual people. Robbie’s endlessly watchable Harley Quinn is the only one of the main group who breaks even, and though Leto’s Joker isn’t on-screen for very long (seriously, you can cut out all of his scenes and nothing would be changed at all), his isn’t a bad interpretation of Batman’s arch-nemesis and we’d be lying if we said we weren’t interested in where he could take the character next. Nothing else, from the action to the score to the visual effects, is strong enough for the film to work as its own entity, and once again it’s all such an on-screen cluster that it’s hard to enjoy as a complete film altogether. There’s so much else about Suicide Squad that we honestly can’t fit it all into one review; but for now, DC is officially three for three, and they seriously need to get their act together if they’re to have even the slightest of chances of making it in the big wide world (here’s looking at you, Wonder Woman). Now, if you’ll excuse us, we’re going to take a swim in that HUGE vault of money that Marvel SO OBVIOUSLY paid us with to write this scathing review of a DC movie. Suicide Squad is a complete and utter mess that suffers greatly from the insane amounts of studio interference that ironically were meant to make the movie better, and barely registers as its own consistent product as a result.